Napa Valley slows down during Cabernet season, making it especially welcoming for visitors. There are many advantages to planning a visit to the Napa Valley between November and April, during the period known as “Cabernet Season.” At this time of year, the pace of life slows down considerably for winemakers, restaurateurs and locals, making the region especially welcoming for those who love food and wines. After the busy harvest season, the new vintages are aging in cellars and caves, so vintners can relax and interact more leisurely with guests in tasting rooms and shops. Without the crowds, coveted restaurant tables—as well as reservations at hotels, resorts and B&Bs—are easier to come by, too, with many offering seasonal discounts. It’s also easier to get around during the “slow season.” Visitors are less likely to have to contend with heavy traffic or bottlenecks as they traverse busy California Route 29, the major thoroughfare extending through the valley from Calistoga in the north to American Canyon in the south. And although winter temperatures can get chilly, especially at night, they are relatively mild compared to those in the Northeast and Midwest. During the coldest months of December and January, daytime temperatures average in the mid-50s and brief periods of rain are interspersed with bright sunshine. Napa truly has four distinct seasons, each with its own appeal and natural beauty. And although the vines are bare in winter, a brilliant carpet of yellow mustard flowers frames them until green buds emerge again in the spring. “Winter coincides with Cabernet Sauvignon release season, which is when these iconic, rich-bodied varietals first become available for tasting and purchase at wineries,” says Jonathan Elliman, who was raised in the Napa Valley and created CellarPass, a wine country reservation site and app. Every winery, of course, has its own personality. Choosing which ones to visit among the more than 400 in the region depends on where you’re staying, the length of your stay, and the type of experiences you’re seeking (e.g., Are you interested in wine cave tours, barrel tastings, or food and wine pairings, etc.?). It’s prudent to do research online in advance; most winery websites provide detailed information about offerings and costs, including which ones require reservations. Elliman of CellarPass suggests limiting visits to no more than three wineries per day. At tastings, he recommends pouring out wines you don’t like (no one will be offended) and keeping hydrated by drinking lots of water (at least one or two glasses for every glass of wine). If you stay in downtown Napa or the town of Yountville, you’ll find many tasting rooms within walking distance of your lodging. A few ideas for winery visits: Wine production in Napa has a long and interesting history. Charles Krug, the oldest commercial winery still in operation, dates back to 1861. Wine pioneer Robert Mondavi built the first new winery here after the repeal of prohibition in 1933. But Beringer holds the record as the winery in longest continuous operation, having produced sacramental wines during prohibition to maintain that status. The Hess Collection, located in an historic 1903 stone winery in the hills above Napa, offers free access to Donald Hess’ extensive contemporary art collection. Across the valley, Stag’s Leap Wine Cellars is one of the legendary producers that helped put California Cabernets on the world stage by winning first place at the famous 1976 Judgment of Paris tasting. Some wineries are not-to-be-missed because they’re so quirky. At Raymond Vineyard and Cellar in St. Helena, visit the Crystal Cellar, a stainless steel-walled tasting room with a mirrored bar where Cabernet Sauvignons are poured from Baccarat decanters. The winery also has a Corridor of Senses where visitors can learn about distinct wine aromas. At the Quixote Winery off the Silverado Trail in Napa, known for its Petite Syrah and Cabernet Sauvignon, you’ll be wowed by the winery’s Gaudi-like architecture. In addition to major wineries, Elliman suggests seeking out other hidden gems—intimate small-batch wineries with limited productions. “Some of my favorites are Bravante Vineyards in Angwin; Saddleback Cellars and B Cellars in Oakville; Del Dotto Vineyards, Flora Springs Winery and Hunnicutt Wines in St. Helena; and Bell Wine Cellars in Yountville,” he says. Driving along Route 29, you might get the impression that the valley is awash with vineyards but they occupy only nine percent of the land area. There are also many working farms and gardens, and with more than 125 restaurants, deciding where to eat can also be daunting. Seasonal menus in Napa typically pair heartier winter dishes with the rich Cabernets. One great restaurant choice is Food Network celebrity chef Michael Chiarello’s Bottega in Yountville that offers a contemporary take on bold Italian flavors. During Cabernet season, diners can order a rack of lamb marinated with grape pomace served with a creamy ancient grain polenta. Another popular staple on the menu is smoked and braised short ribs. Both dishes pair perfectly with a glass of the Chiarello Family Vineyards Eileen Cabernet. 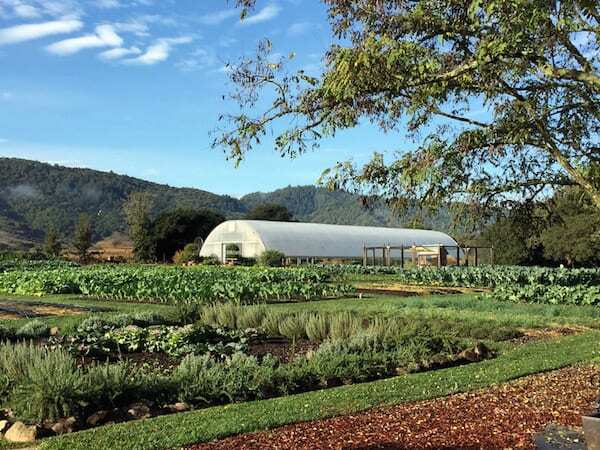 A cradle of sustainable farm-to-table cooking, Napa was the site of the country’s first agricultural preserve (established in 1968). The sprawling Greystone campus of the Culinary Institute of America (CIA), located in St. Helena, has spawned many of the area’s talented chefs. Known as the nation’s preeminent not-for-profit culinary college, it offers tastings, courses for food enthusiasts, public restaurants, and a retail store with every kitchen gadget imaginable. With eleven Michelin stars, Napa has the highest per capita concentration of Michelin-starred restaurants of any wine region in the world. During the slow season, it is easier to snag hard-to-get reservations at the two Michelin three-stars: The Restaurant at Meadowood in St. Helena and The French Laundry in Yountville. Two Napa restaurants joined five others from 2014 in achieving Bib Gourmand status for serving high-quality, affordable meals in the latest (2015) Michelin ratings: Grace’s Table in Napa (a great choice for breakfast or brunch) and the recently opened Brasswood in St. Helena, a Northern Californian take on the British gastropub. The dishes and ambiance of Bistro Jeanty in Yountville, recognized as a Bib Gourmand last year, transport diners to France. Ask for a table by the fireplace and order the signature tomato soup with a puffed pastry crust. Depending on your timing, other seasonal events worth checking out include a film festival (November), wine and food festival (November), truffle festival (January), marathon (March), and arts festival (April). You’ll wonder how this could possibly be considered low season. Many hotels and resorts offer Cabernet Season packages with special pricing and extras, including Auberge du Soleil in Rutherford, Harvest Inn by Charlie Palmer in St. Helena, the Villagio Inn and Spa in Yountville, and the Meritage Resort and Spa and Napa River Inn in Napa. For visitor guides and additional information on Cabernet Season offers, see the VisitNapaValley website. The Napa Valley is about 60 miles (1.5 hours driving time without traffic) from three international airports: San Francisco (SFO), Oakland (OAK) and Sacramento (SMF). Visitors can also reach Napa using an airport shuttle bus or via the Vallejo Baylink Ferry and local bus from the ferry station to Napa. Cabernet is my fave – I must go and drink some to take all the extras off their hands~! What I love about wine regions is their close relationship with nature. It allows us all to realize that the natural world is one to be in concert with, and not the other way around. Cabernet season reminds us of that wonderful rhythm. To me, this makes wine, vineyards, and wineries more appealing than many other travel destinations.